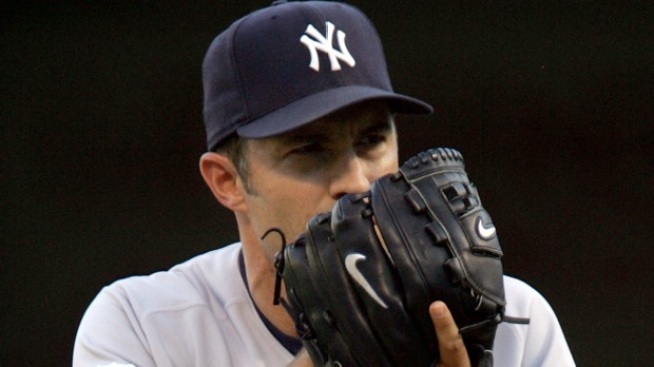 Mussina Retires, Will Curse on the Yanks Be Lifted? If Mussina squints, he'll probably see someone pitching just a little bit better than him. One could say the New York Yankees haven't won a World Series in eight years. One could also say they haven't won a World Series since Mike Mussina joined the team. Those words might strike as cold or distant for the occasion of a bona fide class act deciding to retire. But then again, Mussina has always been a cold distant player; both in personality and as an object of fandom. An intellectual reclusive that likes to play crosswords, he lacked that particular effusive personality that endears players to fans. This solidly second-place sensibility was in accordance with his talent as well; without question Muss has been among the berst pitchers of our generation, but the only definitive statement you could make about him is that he was always among the best, never the actual best. Most of the great pitchers of our generation (think Pedro, Maddux, Clemens, Schilling, Unit) at some point or another could pound their chest and declare themselves king of the diamond. His stats and accomplishments also support this bridesmaid-never-the-bride status: He may be the last guy to get this close to 300 wins, but not actually make sure he gets there. He never won a CY Young, or an ERA title. Or the big game in a World Series. It even feels strangely appropriate that the first time he reaches the 20-win plateau in his "crafty-veteran" stage of his career, for a non-contending Yankees team. For Mussina second place wasn't a bad thing, it was the only thing. And it may legitimately be called "the curse of Mussina" because he seemed to be the first Yankee signing to reflect a purely mercenary outlook after the glorious homegrown dynasty days. The star pitcher from the then-rival Orioles; both the team and player had to sell a little of their soul to team up with the enemy for money/winning purposes. One could see this as the start of a trend for acquiring talents like Randy Johnson, A-Rod, Pavano etc. Players that conjure thoughts of voodoo when discussing their inability to translate their skills at a championship level. Mike Mussina was the quintessential good-but-not-good-enough-for-New-York player. Over time, that became endearing. With his retiring we might find out it was also how the Yankees became a second-place teams over the past 8 seasons.